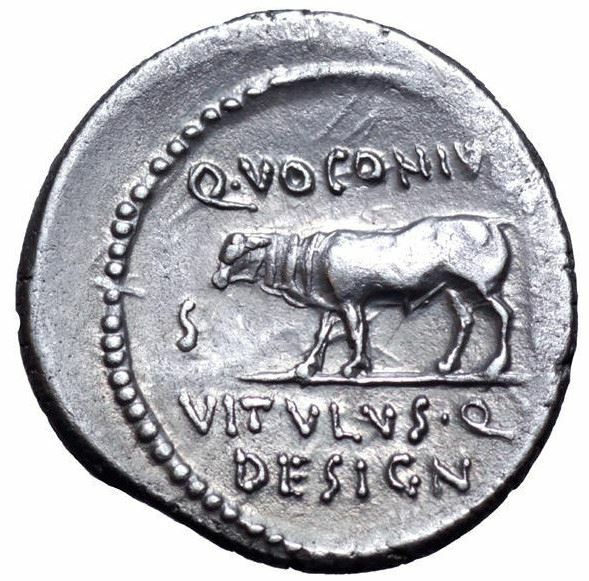 Q. Voconius Vitulus was one of the moneyers for the year 40 BC, as well as Quaestor Designatum. Gens Voconia was a minor gens about whom very little is known. A Lex Voconia was introduced in 169 BC by Q. Voconius Saxa with support from Cato the Elder. It prohibited those who owned property valued at 100,000 asses (or perhaps sesterces) from making a woman their heir. This particular limit was not arbitrary but was apparently the traditional property qualification for admission to the highest class in the Comitia Centuriata, and thus the minimum qualification for the Equestrian Order. In addition, it prohibited extraordinary legacies in a will of a greater value than the inheritance of the ordinary heirs. This intention of this legislation according to Gellius was sumptuary in that it limited the wealth available to women, who were presumed to expend it on useless luxury goods. The law only applied to inheritances by testament and did not affect the intestate law of succession of women, although later this was limited to inheriting to the third degree.